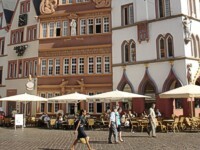 The restaurant and café is located in of Triers most significant sights. Enjoy good home cooking with a Mediterranean flair as well as exquisite cakes and pastries at this historic site. We offer breakfast, lunch and dinner; choose from our large selection of exquisite cakes and pastries, coffee specialties, a decent draft or regional wines and champagnes. 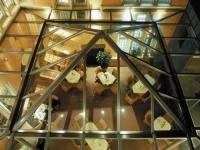 Especially the WINTERGARDEN and the CAFÉ CLASSIC offer a relaxing atmosphere for dining. For rooms seating up to 80 persons ask for the ROOM VICTOR HUGO at the first floor; it is perfect for birthday parties, christenings and lots of social or business occasions. 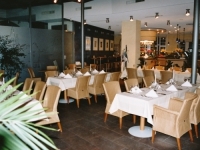 We will be glad to arrange a delicate menu or a buffet as required. 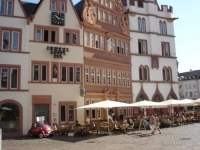 Combine your daytrip to Trier with a visit to the toys museum located at the upper floors of our house. 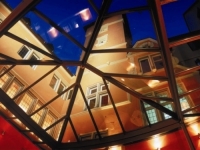 We will gladly answer any questions you might have and look forward to welcome you.